Matudnila.com - A Cebu Events Blog: What best goes with Starbucks Frappucino flavors or your brewed Coffee? Home Starbucks VIA Matcha What best goes with Starbucks Frappucino flavors or your brewed Coffee? What best goes with Starbucks Frappucino flavors or your brewed Coffee? 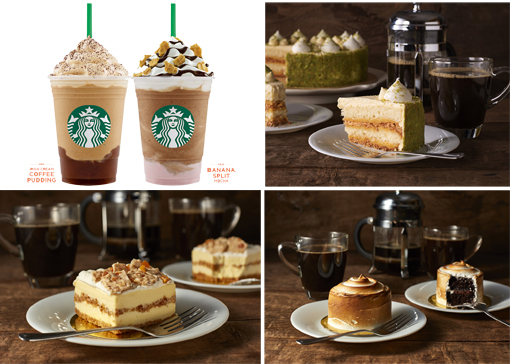 Wondering what best goes with Starbucks Banana Split Mocha Frappuccino and Irish Cream Coffee Pudding Frappuccino, the newest yet Frappuccino flavors, or your perfectly brewed cup of coffee? Well, Starbucks introduces food items to complement them. The new Lime Torte Cake is a symphony of flavors and texture with its sweet and tangy flavor partnered with crunchy and crumbly cake. The Mango Crunch Cake will surely delight for those looking for traditional Filipino flavors with smooth and creamy mousse with Philippine mangoes layered with crumbly and buttery graham and crunchy white almond. The Chocolate Marshmallow Cake, a moist chocolate layer cake with smooth and creamy chocolate truffle and then frosted with marshmallow icing will surely entice Chocolate lovers. Looking for a delectable and healthy treat? Starbucks also has two new Greek Yogurt Parfaits, the Blueberry Greek Yogurt Parfait is made with creamy Greek yogurt layered with a sweet and tart blueberry compote and then topped with crunchy oat granola while the Mango Greek Yogurt Parfait is made with sweet mango compote and Greek yogurt finished with a sprinkling of crunchy oat granola. The Whole Wheat Bagel made with linseeds, rye and soy grits, corn semolina, and oats is another perfect complement to your coffee. The Bagel Bites filled with Cream Cheese, the mini herbed bagels are generously stuffed with cream cheese is a more savory option that will surely satisfy you with every bite. Rare one-lot coffee Starbucks Reserve Rwanda Musasa and Starbucks Reserve Nicaragua Maracaturra are also available for Coffee cognoscenti. Starbucks has also released its Cold Brew Pitcher Packs for those who are looking for the perfect cold brew experience at home. It's a perfect blend of Latin American and African beans that are roasted to bring out their rich and dense flavor when brewed cold. Its flavor is balanced, smooth, and rich with subtle sweet chocolatey notes. You simply need to steep the pitcher packs in your ref overnight to brew a perfect pitcher. Starbucks VIA Matcha beverage can also be enjoyed wherever you are, The perfectly blended Matcha delivers a unique drinking-experience at home or away. This month, Starbucks Cards three new designs is now available: the Chill Mini Card, Iced Coffee Card, and the Father's Day Card. The Chill Mini Card and the Father's Day Card are available for a minimum activation fee of 500 pesos. The Iced Coffee Card is available for a minimum activation fee of 1,000 pesos. 0 comments: on "What best goes with Starbucks Frappucino flavors or your brewed Coffee?"